This Abbotsford pizza joint is serving up traditional pizzas with new twists — and to a hip hop soundtrack. There's no shortage of Italian fare in Abbotsford. But, as of last November, the inner west riverside suburb has been home to a pizzeria that's doing things a little differently. 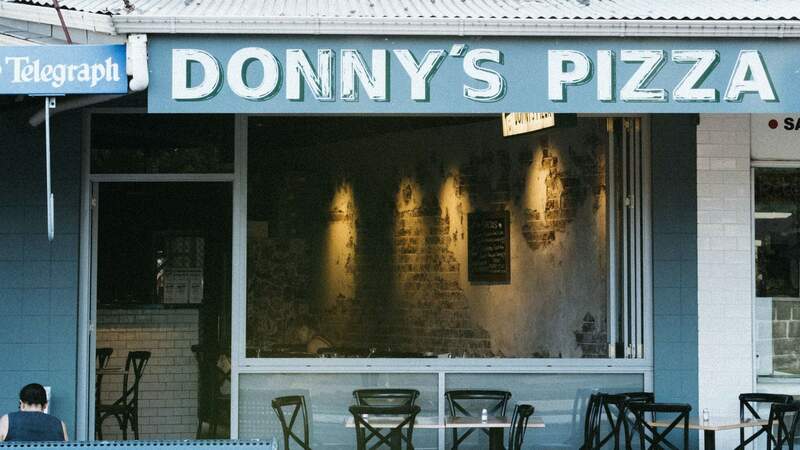 Donny's Pizza takeaway joint is offering an authentic menu, house-made everything and a self-professed Big Poppa's-inspired hip-hop backdrop. The Donny's team comprises of brothers Daniel and Alexander Carnevale, along with their long time mate and executive chef Matthew Serci. He's worked at a few of Sydney's Italian mainstays, including as sous chef at Paddingtons's Buon Ricordo Ristorante and most recently as head chef at Drummoyne's Ecco Ristorante. The latter also happens to be owned by the Carnevale family and is where Serci first started out. "We decided to open a local pizzeria where we grew up eating authentic Italian cooking from our grandparents," says Daniel Carnevale. "But we're a young team, so we also want to keep it super casual with an Italian-Australian vibe and hip-hop playlist." The rustic 60 seater boasts a trattoria-style fit-out with exposed brick walls, polished concrete floors and stripped-back furnishings. While the atmosphere aims to cater toward modern Sydney sensibilities, the Italian authenticity can be found in the quality of the ingredients — which are both imported and locally sourced. Impressively, everything is made in-house. To this end, the team has brought in head pizzaiolo Stefano Tafuri, who is turning out Roman-style pizzas. He takes his dough very seriously, using all high quality Italian flour with a 48-hour rise time to create classics like margheritas, capricciosas and supremes. Though the pizzas may sound like your average styles, the difference is in the toppings. For example, the Meatlovers ($26) uses house-made sausage and smoked brisket, while the Pineapple Express ($23) uses maple-glazed bacon instead of deli ham to take the stock-standard Hawaiian up a notch. There's also the Trufflemen up for grabs, topped with fior di latte, mushroom, truffle, prosciutto and Sardinian pecorino ($26). All pastas are made in-house every day, too — think tagliatelle or lasagna with six-hour braised pork and veal ragu, or the gnocchi with house-made sausage and saffron ($27 each). For shared starters, there are zucchini flowers stuffed with scamorza cheese and double-smoked ham ($7 each) and mini deep-fried pizzas filled with tomato, ricotta, prosciutto di parma ($9). For the time being, Donny's is BYO only — and will continue to be even after a liquor licence is secured. Once the licence is in place, though, expect Italian offerings aplenty, including imported beers and spritzes. If all goes well, the team will also look to expand the Donny's brand to Newtown or the inner city within the year.